Last year I shared my thoughts on being and remaining a Full Time Working Mum or FTWM after DinoBoy was born. Today I will let you peek into the stuffs I do after I knock off from work. I am very blessed to be working in a company that is pro-family, this means that I am able to knock off work on the dot. It also means that when I am away from the office either on medical leave, on leave for holiday or to take care of the boy when he is unwell, the office will not call me constantly. They will try to solve any issues themselves and if there is really a need they will send me a text/wassapp to ask me for help. I can declare loudly that my bosses (all 7 of them!) are wonderful and supportive! I used to have After Work Happy Hours where I get to do a little bit of shopping, have dinner dates with girlfriends as I could rely on my Mum to help me fetch DinoBoy from school. Since Mum left us last November my priorities and routine changed, no more gatherings and it's straight to the school to fetch DinoBoy from student care centre. Luckily I have a great friend to help me. Her girl is studying in the same school and student care as DinoBoy, she has been helping me to fetch the boy for me. Not only that, she also brings him to dinner first while I made my way down to meet them. This means that I do not have to rush to catch the train to try to fetch the boy before 7pm. On days that I feel like cooking dinner, I will try to get it ready as fast as I cook. 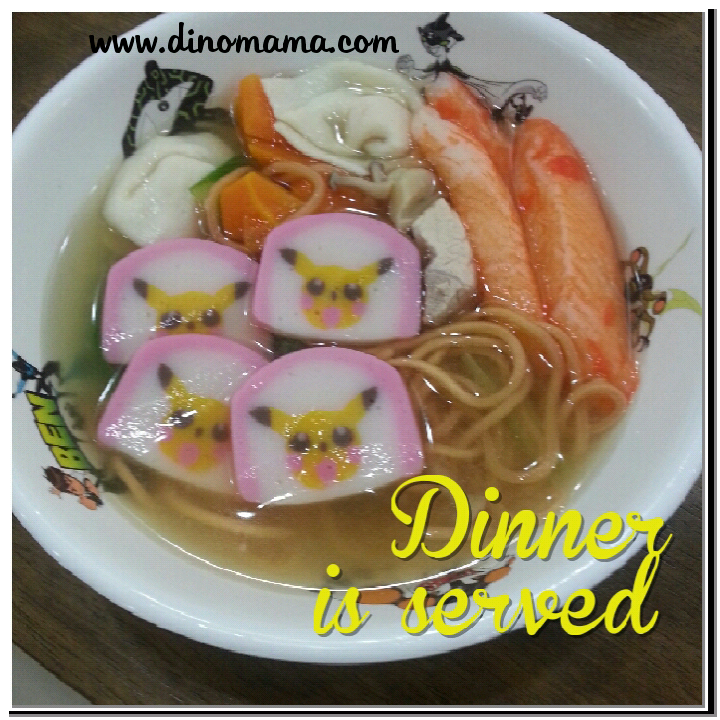 With practice and of course with some useful kitchen gadgets plus early preparation dinner is usually done in under 30mins, such as this miso soup noodle with crab sticks, fish wanton, carrots, meat, Pikachu fishcakes and seaweed. I simply adores one pot dish which we can have them as dinner for 2 days in a row or simple one dish meal that takes about 15 minutes to get it done. We usually reach home around 8pm and immediately start our night routine. We have about 2.5 hours before we turn in for the night. First on the list is 30 - 45 mins of revision according to our timetable. We started this since DinoBoy entered primary 1 last year but was not consistent, I decided to enforce it so that it becomes a habit, it can also ensure that he is able to tackle the current subjects effortlessly. Next year Science will be an additional subject he will have to study, even though DinoBoy is very interested in Science and we have been doing a little bit of Science experiments I think we still have to spend some time on this subject. Both of us do not like Revision Time but we also know that it is necessary. Most of the time I will sit down with him to supervise him but sometimes I will leave him to put some laundry to wash, work on my blog posts or prepare the food for next day's dinner. Revision ends at around 9.15pm, its time to get ready for bed. DinoBoy can choose to read or we could play board games. On Fridays I allow him to do both, which usually will make him very happy, sometimes he will be too excited to go to bed at the usual bed time but I am ok since next day is Saturday. I can guarantee you that our Game Time is NOT like this! It is always fun game of the dreadful Snake & Ladders, Ludo, Ducks in a Row, Reversi, Chinese chess. We just started this new game; Secret Code and DinoBoy is still trying to learn the rules of the game. 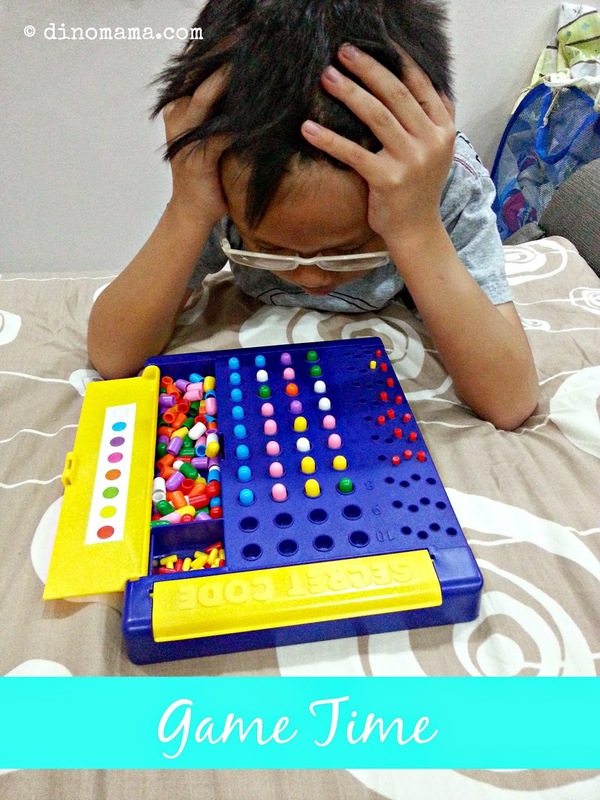 He got confused with the red & yellow clues and was trying real hard to concentrate so that he can figure them out. Bed time is at 10.30pm, both for me and DinoBoy. HOORAY!!!! Now you will say that I am one of the few lucky mummy who gets to sleep so early. Truth is I can't keep my eyes open after that, sometimes I fall asleep at 9.30pm. Some days I wish I can stay up late to do my stuffs but no such luck. I wakes up at 5.30am every morning, this is a habit which I can't seems to get rid of, that perhaps explains why I am so tired at the end of the day. I must say since the birth of DinoBoy, minus the "I stayed up late after my child is asleep" part, my after work routine is almost the same. I still get my 8 hours of sleep which does not seems to be ever enough, some days I wake up feeling tired and wish its weekend. With only 2.5hours on weekdays, there isn't much fun and interesting things I can do with DinoBoy. 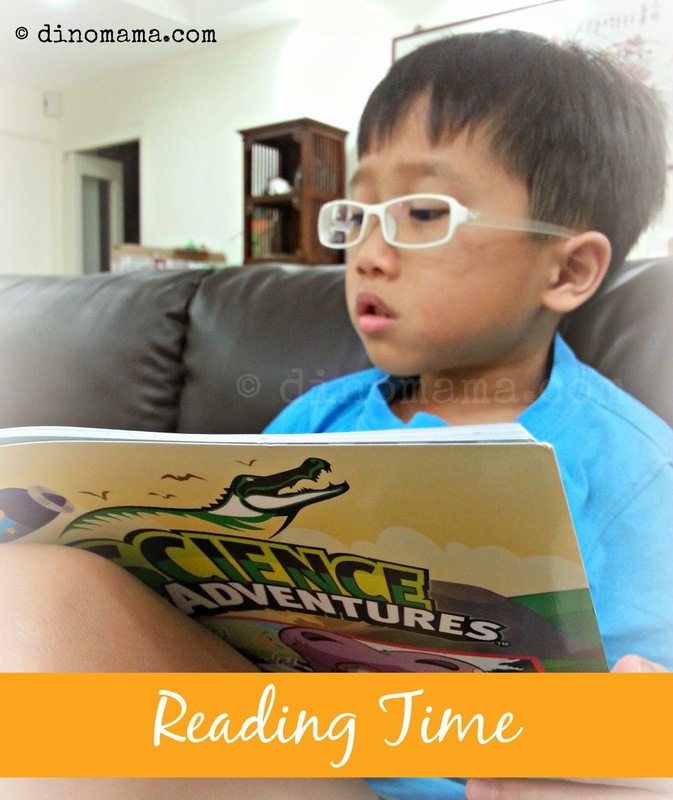 We have a No Screen Time Rule on weekdays so I have to engage DinoBoy in some other ways, the reading and board games helps a lot, besides being bonding time for us it also creates a stress free nights which is great for winding down and prepare for bed. So there you have it, my After Work Hours. Is your after work hours same as mine or perhaps you can spot yours in one of the other 21 FTWM's after work hours. 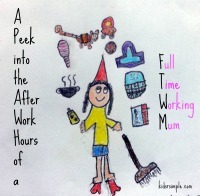 This is a blog train hosted by Kids R Simple on "A Peek into the After Work Hours of a FTWM". 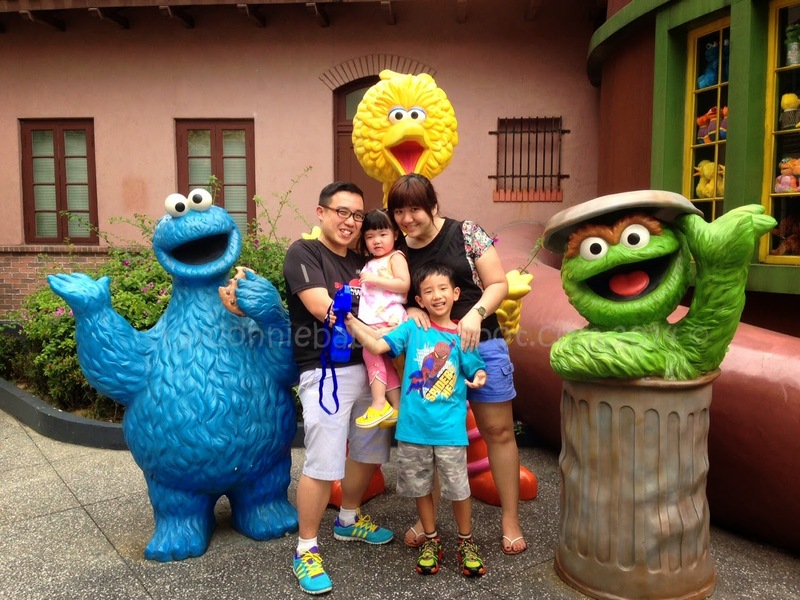 Read about how the other 21 FTWMs handle their kids and household everyday from 1 June to 21 June. The aim is to give other working mums motivation, ideas and support to deal with the everyday demands of juggling work and family while keeping sane. We will be happy to hear your story, tips and even an encouraging word will make our day! Share your thoughts in the comments! Connie is a FTWM who blogs at www.rayconniebaby.blogspot.com who is an apple convert, writes about the growth of her family, her growing passion and knowledge of healthy meals and random thoughts. 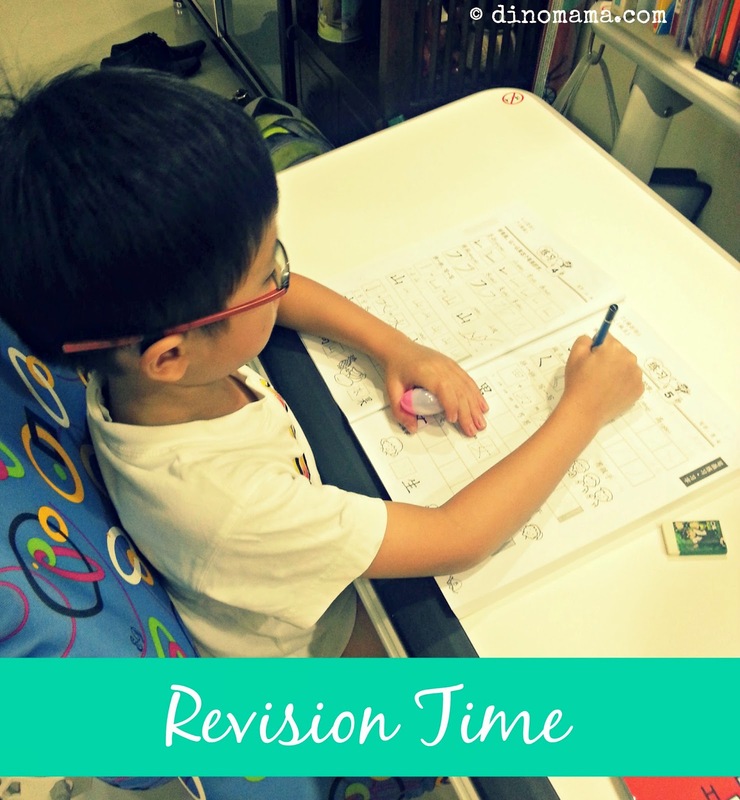 "Parenting wasn't an easy journey from the beginning but nobody did tell the satisfaction at the end of the journey"
Jen, I love what you say about "Neither of us like revision time but we both think it's necessary". Z is so dong shi!! I can so understand the falling asleep before child part! It happens to me too! I somehow find it comforting to read all your blog posts and realise that no FTWMs see their children that much during the week! Very interesting to see what your routine is like. Time is indeed such a precious commodity for you. It's great that you've found various people you can depend on for support to make it all possible.